Management Tools E-107. June 2015. By-Law? or Bye-Law?? The spellings of both terms 'by-laws' and 'bye-laws' are correct, and both are widely accepted and used worldwide. They essentially mean the same - rules of procedure made by an organization for the regulation, administration or management of its organizational structure and operational activities. They usually deal with matters of internal regulation, and are binding on all persons within the organization. While we accept both spellings, for the sake of consistency, GDRC uses 'bye-laws' in the NGO Cafe. concrete set of bye-laws form the core of an NGO's identity and structure. Bye-Laws are called by different names in different countries, including "Articles of Association", "Statutes", "Articles of Incorporation", "Constitution" etc. 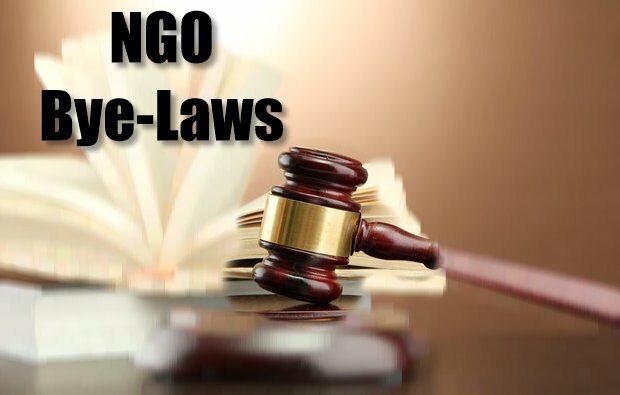 Having a clear set of bye-laws not only provide clarity to an NGO's structure and functioning, it also provides a basis for trustworthy relationships with other organizations and entities, and in building the NGO's identity. In many countries, developing and adopting a set of bye-laws (and taking action on the issues stipulated in the bye-laws) is a critical pre-requisite for its official registration with local authorities. The table below provides a standard list of articles, their content, and sample text, that can be selected from, and adopted by, a new NGO. Note that this set is not targeted at any particular country and is provided an indicator only. It is also in no way complete. From the list below, an NGO can select only those articles that are relevant and necessary to their needs. Specific countries may have their own stipulations for the contents of the bye-laws, and these will have to be referred to and satisfied, before the bye-laws are drawn and adopted. As mentioned in Articles 47-49, the bye-laws can also be changed or modified as the need arises. Go through the list below and identify which articles are needed and relevant. Not all are needed or are relevant to the type of NGO being set up. Fill in the content for each article by answering the questions listed, and matching them with your own organizational plans for the NGO. * These items can be part of a bye-laws article itself! Preamble What is the bye-laws about? What will it contain? Name, Acronym and Logo What is the name of the NGO? What is its official acronym? If available, how does its logo design look like? Applicable laws and legal status Under what local and national laws is the NGO set up? Does it have official consultative status with the UN, or is it UN-accredited? Is it a member of any national, regional or international network/assication/initiative? Sphere of activities What activities will the NGO undertake? What will be its spheres (or categories) of activities? Location and Duration Where is the registered office of the NGO located? What is its postal address? How long will the NGO be set up for - that is, is it for a limited period only, or is it unlimited? Aims, Visions and Mission What are the aims of the NGO? Have goals and objectives been developed? What is its vision statement? What will be the mission of the NGO, and who will be its target beneficiaries? Membership Does the NGO have members? What is the membership structure of the NGO? Qualification What is the qualifications of the NGO's members? Why are such qualifications needed? Admission How will members be invited and admitted to the NGO? What is the procedure? Responsibility What will be the expectations and duties/responsibilities of the NGO members? Consensus Building How will consensus building be achieved among the members? How will decisions be taken on the NGO's activities? What are the procedures? Resignation What is the procedures for a member to resign from the NGO's membership? Who should it be addressed to, and how is it accepted and processed? Expulsion or Suspension Under what circumstances can a member be expulsed or suspended from the NGO? Who will take the decision, and how will it be implemented? What process of redress will be available to the member? Organizational Structure What is the organizational structure of the NGO? What will be the position of the staff members responsible for different aspects of the NGO's programmes? Procedures Will the NGO have a General Assembly? Why is it needed? Who can participate in the general assembly? Is there a proxy policy? How will the proceedings be reported to the general public? Scope What is the scope of the General Assembly? What will be the duties and responsibilities of the General Assembly? Decision-Making How will the General Assembly decisions be taken? How and who can present proposals for decision-making, and what is the procedure/process for taking decisions? Quorum What will be the minimum quorum needed to call for a General Assembly, for the proceedings to take place, and for decisions to be taken? Composition What will the Board consist of? How many members will the Board contain? What will be their positions? Which current working staff members will also be on the Board of the NGO? Eligibility Who will be eligible to become members of the NGO's Board? What will their qualifications be? Selection and Appointment How will potential individuals be identified and selected to the NGO's board? How will the appointment be decided and implemented? Term of Office How long will a member's term of office be on the NGO's Board? Vacancies How will vacancies in the Board's membership be handled? How will the position be advertised and recommendations/applications be processed? Duties and Functions of the Board What will the duties and functions of the Board be? What is the NGO's expectation of a Board member? Decision-making. Like the General Assembly, how will decisions be taken in Board meetings? What is the procedure and quorum for a decision to be accepted and implemented? Press statements. Who will prepare Press Statements to reflect the proceedings and functionings of a Board meeting or NGO's activities? How will a Board's acceptance of media/press statements be sought? Meetings. What is the usual agenda for a board meeting? Who will call it, and how will the proceedings be handled? Quorum What will be the minimum quorum needed to call for a Board meeting, for the proceedings to take place, and for decisions to be taken? Resignation If a Board Member wishes to resign from his/her position, how will it be handled? What is the procedure? Removal Under what circumstances can a Board member be removed (either expelled or suspended) from the NGO's Board? What is the procedure, and who has the authority to initiate such a procedure? What process of redress will be available to the Board Member? Running. What committees will be set up to support the functioning of the NGO? (eg., Funding, media, strategy/policy/project development etc.). Aims and Responsibilities Why will these committees be set up? What will be their main aims and responsibilities? Election and Term of office How will the committees be set up? What is the procedure for the election/selection of committee member? What will be their term of office? Duties and Responsibilities What function will the members of the committee perform? What will their duties and responsibilities be? Who will decide the duties and responsiblities, and how can they be modified? Annual Audit. Will the administration and finances of the NGO be audited? What is the procedure of the audit? How will findings of the audit be implemented? Definition How are staff members defined within the overall structure of the NGO's organization? How are they different from other types of members (eg. General Assembly or Board members)? Duties and roles of staff members How many staff members will be working at the NGO (both full-time and part-time)? What will be their duties and roles within the overall functions and activities of the NGO? Hiring and dismissal How will staff members be hired? Under what circumstances will staff members be dismissed or suspended? Who is authorized to take such action? Sources and uses. What is the nature of (financial) resource needs of the NGO? What will be the primary sources of such resources (including private/personal sources). Initial Capital and Assets What will the initial capital needs of the NGO be? What kinds of assets (financial and non-financial) will be needed to start the NGO? Funding Raising. What policy will be put in place by the NGO for fund raising? What purposes will it be used for, and who will be responsible? Liability. What are the applicable liabilities for the NGO? Under what circumstances are these liabilities applied? What procedures are in place to activate these liabilities, and who is responsible for them? Fiscal year/Financial Year What is the duration, and starting month, of the NGO's fiscal/financial year? Applicable law and Court Under what applicable law and court will the NGO be constituted? How will disputes and other legal matters be handled? Dissolution. Under what circumstances can/will the NGO be dissolved? What is the procedure for dissolution? Who will be responsible for dissolving the NGO? Liquidation profit. If profits are generated during the liquidation process of an NGO, how will it be disbursed? What procedures are in place to handle such matters? Coming into force. When do the bye-laws come into force? What is the procedure to ensure that the bye-laws are legally accepted and are also informed to all appropriate/concerned persons? Validity, and extension of validity, of bye-laws What is the period of validity of the bye-laws? What is the procedure to extend the validity of the bye-laws? Additions, modifications and amendments to Articles What is the procedure for additions, modifications and amendments to be made to the articles in the bye-laws? Who is authorized to undertake the task? Also see: "Setting up an NGO's Bye-Laws"
Attribution-ShareAlike 4.0 International License. You are free to share and adapt this piece of work for your own purposes, as long as it is appropriately citied. .